The Railbus was a 1921-built Mack Model AC Railbus that the BC&G acquired in 1941 to provided passenger and mail service between Dundon and Widen, WV, just 18.6 miles away. Twice a day it made the round trip between these two towns and in the late 50s with Kenneth Brady as the engineer. Originally built with a 64 hp 4-cylinder engine, the BC&G replaced it with a “more modern” Chevrolet engine and opened up the front of the hood for additional cooling. Styrene sheet is the principle material used in the model construction. 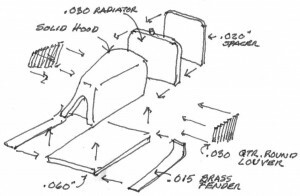 Brass was used for some chassis members, body moldings, pilot, fenders, handrails and horn. The Chassis was made from brass channel shapes that are soldered together and then bonded to the 0.100-styrene floor with CA adhesive. The Hood was carved from a solid block of styrene to the required shape. The louvers were made from 0.030-styrene quarter round shapes bonded to the hood with plastic solvent adhesive. The hood hinges are 0.010-styrene. The Body was made from three layers of styrene. 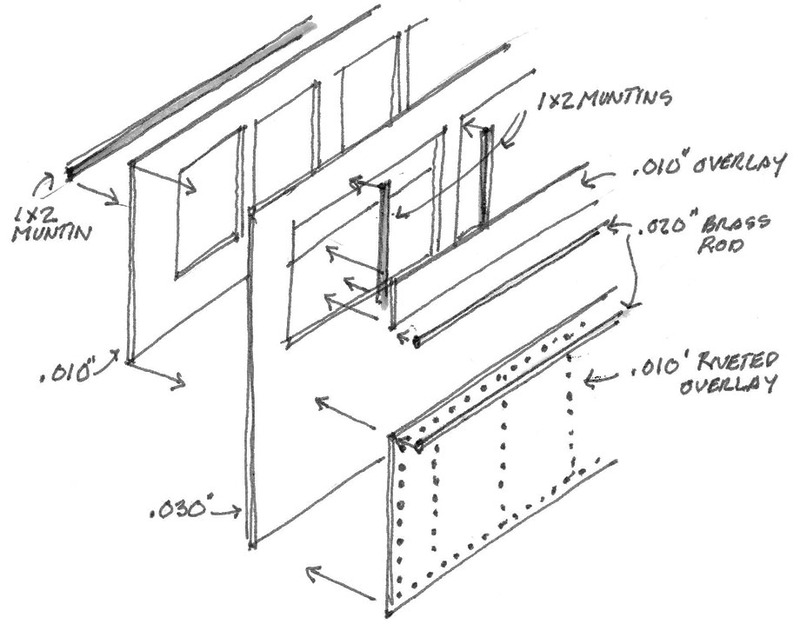 The inner layer, which has the individual window sash cut into it, is 0.010-styrene; the middle layer, which has the paired windows and doors cut into it, is 0.030-styrene; and the overlays, which includes the embossed rivets, is 0.010-styrene. 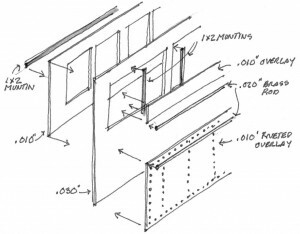 The horizontal and vertical window muntins are scale 1″x2″ styrene strips. All of the styrene was bonded together with plastic solvent adhesive. The molding above and below the windows was made from 0.020-brass rod bonded to the body with CA adhesive. The rivets were hand embossed using a NMSL rivet tool. The Roof was made from a layer of 0.090-styrene bonded to an interior layer of 0.030-styrene. Lead weights were adhered to the underside of the roof to increase the weight for better electrical pickup. The canvas covering was simulated by applying a single layer of facial tissue to the roof that is coated with ‘Grimy Black’ enamel and then given an overcoat of the same enamel. The roof is removable to allow access to the interior and is retained by a screw from the underside of the chassis. The front Fenders were made from 0.015-brass sheet cut and formed to shape and then bonded to the body with CA adhesive. The Pilot was made from brass angles with holes drilled to locate the brass rods; the assembly was soldered together; the projecting ends filed off and pilot was bonded to the body with CA adhesive. The Handrails, Grab Irons and Door Handles were formed from 0.010-brass wire and applied to the body with CA adhesive. Glazing was made from “overhead projector” film and bonded to the body, after painting and weathering, with CA adhesive. Front and rear Headlights were made from aluminum tubes with 14-volt light bulbs wired to the decoder to provide directional lighting. The nonfunctioning headlights were made from styrene rod and brass wire. The front Steps were made from styrene while the rear was made from brass wire. The Grille was made from 0.010-brass wire soldered together. The Motor/Gear unit is a NWSL “Flea III” assembly, supplied by custom order, with 36″ nine spoke wheels. It is built into a styrene subassembly that includes the brakes, simulated leaf springs and supports, brass sand pipes, simulated drive staff and continuation of the brass chassis channels in styrene. The motor was hard-wired for DCC. The sub assembly fastens into the body assembly with two brass screws. A LokSound decoder and sound system was hard-wired into the model to replicate the sounds of the Railbus. The front truck was made to resemble the BC&G prototype from styrene sections that were bonded together with plastic solvent adhesive. The three major components, truck sides and cross member, were fastened together using brass pins and CA adhesive. The 26″ NWSL wheels provide electrical power pickup through 0.008-phosphorus bronze ‘wiper’ wires to the decoder. 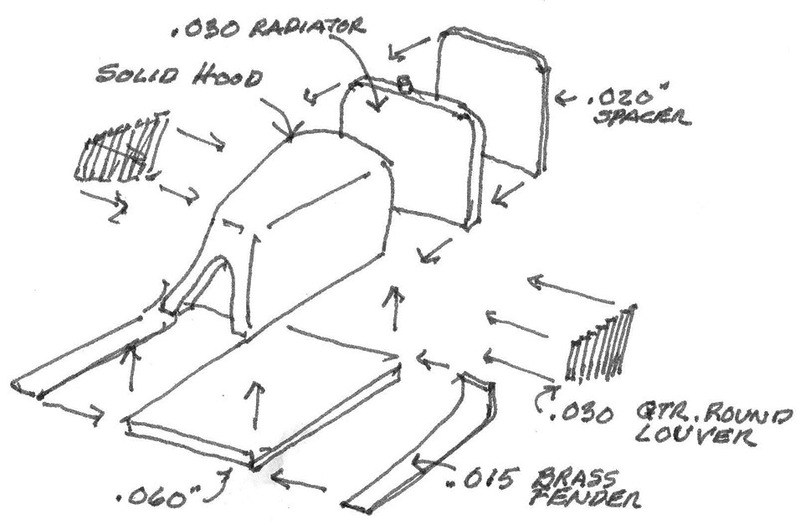 Simulated brake shoes and journal boxes were made from styrene. Interior: An interior was made for the passenger compartment from styrene with a raised floor, to clear the decoder and speaker located below. Lead sheet was bonded to the underside of the raised floor for additional weight. Because of the raised floor, the bench seats had to be abbreviated, as did the five passenger figures, plus the engineer and a coal stove. In the baggage compartment, wood crates made from scale lumber, cover the motor. Exterior: There are many details included on the exterior; the brass horn, the roof ventilators and the brass radiator cap, the headlights on the pilot (all turned using a Dremel tool and a file as a lathe); the grille; the battery box located on the left front fender; the square gas tanks with their filler spouts; the underbody storage shelves; the smoke stack; and all the details at the rear axle, i.e., springs, brakes and sanding pipes, just like the BC&G prototype. The model is finished in Floquil’s enamels in colors corresponding to the BC&G prototype for the period. Custom-made decals were applied and the model was given a light weathering using Floquil’s ‘mud’ and ‘dust’ and a light wash of India ink. The model is entirely scratchbuilt except for the following allowable items: Motor/Gear unit – Wheels – Light Bulbs – DCC Decoder and Sound system. Phil’s Railbus model won 2nd Place in the “Scratchbuilt Locomotive Other” category at the NMRA National Convention in July 2011 and 1st Place “Diesel” category at the NMRA MCoR Regional Convention in June 2011. 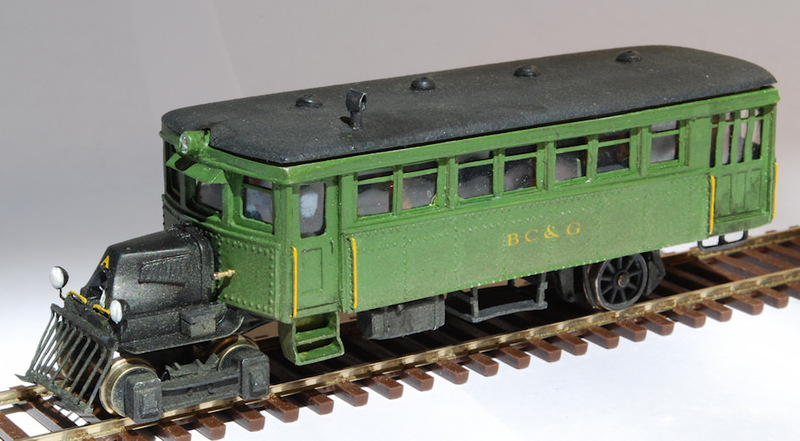 His scratch building article on the BC&G Railbus A appeared in the December 2009 issue of Railroad Model Craftsman.